Primeiro um esclarecimento: SMH é o Sydney Morning Herald, o maior jornal de NSW. Westpac, por sua vez, é um dos maiores bancos da Austrália. E Kent Street uma das ruas do centro da cidade. Na última sexta leio uma notícia bizarra no SMH, cujo resumo é: assalto a um banco no meio do centro da cidade (de Sydney). As 11:15 da manha de sexta-feira um Porsche (?!?) roubado bate na parede de vidro do banco. 2 homens armados com marretas (?!?) entram no banco e roubam os caixas (se é que conseguiram levar algo, ninguém sabe ainda), fugindo em seguida num Subaru WRX azul. Os funcionários do banco (tellers = caixa do banco) ficaram tão abalados que tiveram que ser atendidos por paramédicos (?!?). Enquanto isso as pessoas em volta tiram foto da cena e alguns chegam a se aproximar do local achando que se tratava de mero acidente de transito (?!?) – ninguém pensaria em assalto aqui, claro! Segue a íntegra em inglês, com as fotos que ilustravam a reportagem online. 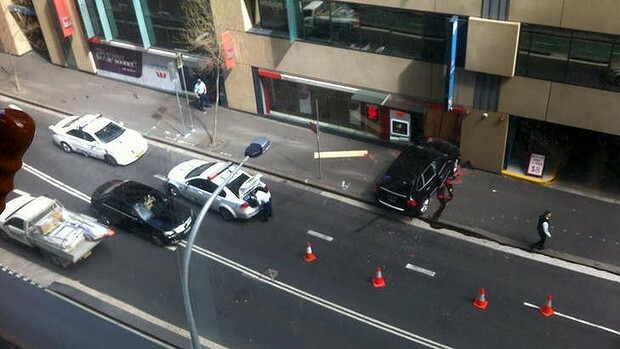 Thieves have carried out a daring ram-raid on a bank in Sydney's CBD, driving a stolen Porsche four-wheel-drive into the front of a Westpac branch. 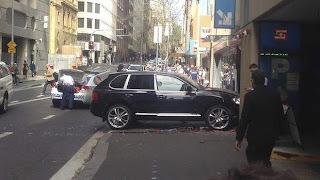 Stunned witnesses said the robbery occurred on Kent Street about 11.15am, and the vehicle's impact caused the building to shake and the wall to partially collapse. Two masked men, armed with sledgehammers, were seen running out of the building carrying bags and hopping into a stolen blue Subaru WRX getaway vehicle, where a driver was waiting. The entire robbery took less than five minutes, with bystanders capturing photographs of the bandits while the robbery was in progress. An officer worker, who asked not to be named, said he was walking down Erskine Street when he heard a loud bang. ‘‘At first we thought it was coming from some building works,’’ he said. A masked man is seen outside the bank. The office worker called triple-0. 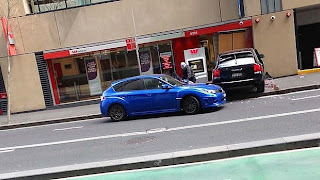 He said the Subaru was parked behind the Porsche, and the getaway driver was ‘‘clearly getting nervous waiting for the others to come out, especially as a number of people were photographing him’’. ‘‘He started shouting to the others to hurry up. After a few minutes the others came out and the Subaru sped off, turning down Napoleon Street. I didn’t think they got away with much, if anything,’’ he said. 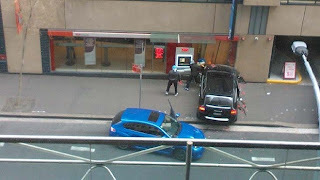 The vehicle that rammed into the bank appeared to be a Porsche Cayenne. Police said the men entered the bank through the opening and took money from the tellers. Acting Superintendent David Roptell, commander of The Rocks local area command, said a number of bank staff members were shaken up and had been treated by paramedics. "It's a brazen attempt as you can see. The offenders and their faces were obscured," he said. "We’re appealing for witneses that were in the area that may have seen this incident [to contact police]." He said it was unclear at this stage how much cash the thieves took from the tellers. Lars was walking down Kent Street on his way to a job interview when the Porsche crashed into the bank five metres behind him. ‘‘There was a massive thud, a crash,’’ said Lars, who did not want his surname used. ‘‘They didn’t get through the glass the first time. They reversed out and went straight back in. He estimated the whole robbery took only a couple of minutes. Lars said the men were quite large - at least 180 centimetres tall - and were wearing white cloths or bandanas over their faces. Lars said he knew immediately that the men were targeting the bank, and he ran behind a concrete pillar in case they were carrying weapons. But other bystanders began approaching the vehicle. ‘‘People were walking up to it because they thought it was an accident,’’ he said. Matthew, who works in the building opposite the bank, said the four-wheel-drive crashed through the bank's front window, where it remained with its hazard lights on. "They entered the building and came out ... with some bags and escaped in a second vehicle,’’ he said. He said people in his building heard a loud bang when the vehicle crashed into the window. There were quite a few people in the street at the time, he said. 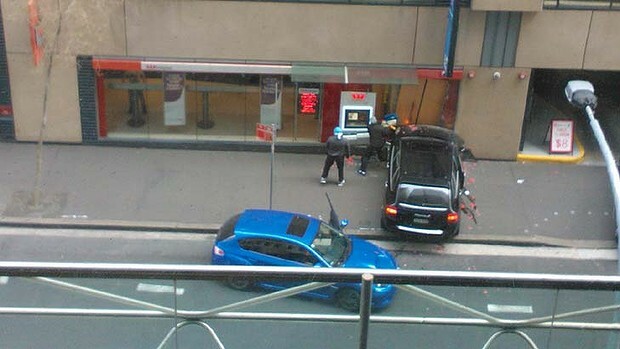 A Westpac spokesman confirmed there was an ‘‘attempted robbery’’ on the Kent Street bank. ‘‘No physical injuries to staff or customers have been reported at this time,’’ he said. ‘‘Our priority is our customers and our employee’s safety and we are currently providing support to them at this time. A number of customers were believed to be in the branch at the time. Não se falava em outra coisa! É tão surreal que nem tem como comentar. 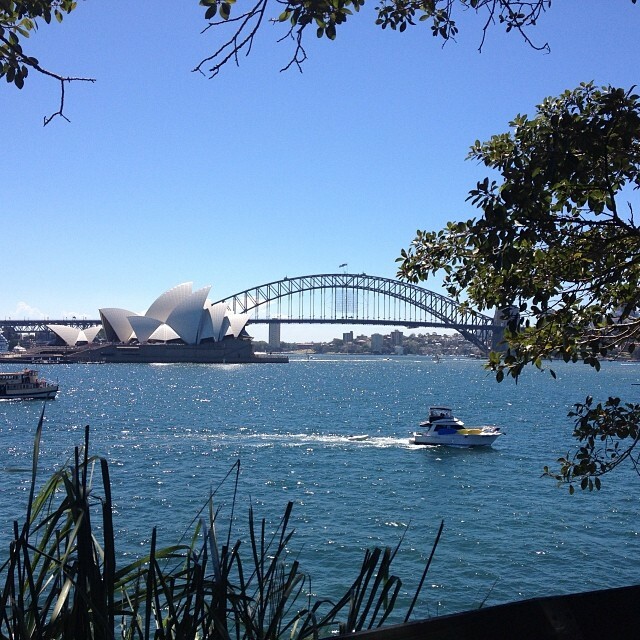 Assalto a Banco em Sydney ????????? ?